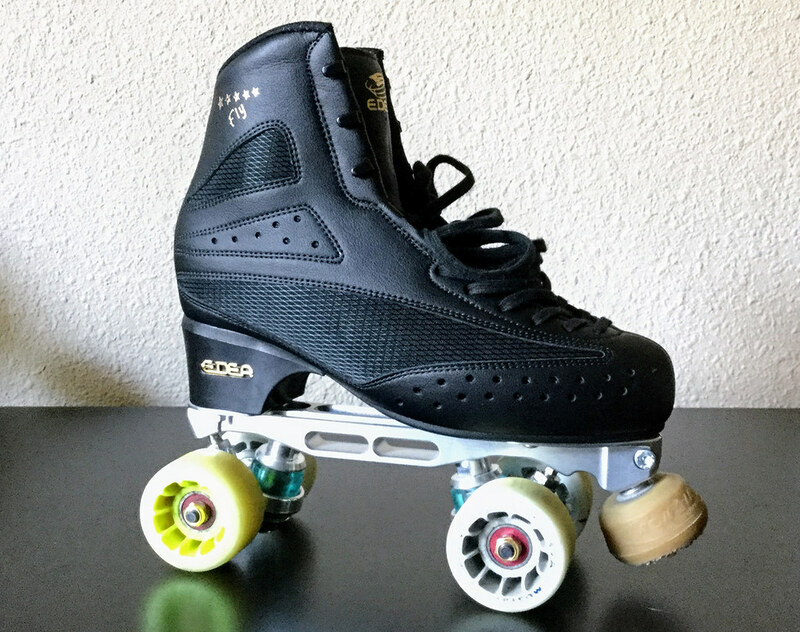 I've been skating on Atlas AE84 Freestyle plates and Risport Diamante boots for over 20 years. A year ago when I decided that I wanted to get back into skating competition I started looking into new plates and boots. While my Risport boot was still in good condition, the more I skated on it the more cramped I started to feel in it, especially around the big toe. As far as my Atlas plate, it was also in great condition with the exception that the cushions needed to be replaced because they got hardened over the years. The problem was finding Atlas skate parts since they are no longer in business. I eventually found some but I figured how hard would it be to find other parts when needed? This all got me thinking about new plates and boots. I asked around about Roll-line plates. They had just arrived on the scene when I stopped skating in 2001 and my old coach was a distributor for them. When I asked around about the difference most skaters and coaches said they were more responsive. After reading as much as I could on them I settled on getting the Roll-Line Mistrals. It had the same design as the Energy without the Energy price tag. The difference in weight between the two plates was not that big of a deal to me as I was used to skating on the heavier Atlas plate anyway. I got the Mistrals back in April and mounted them first on my Risport Diamantes. It didn't take me long to get used to them at all! With in a few minutes after making some adjustments I was able to spin as well as I could on my Atlas plates. It was definitely more responsive but still quite controllable. I used to make sharp hooks on my landings on my Atlas plates but on the Roll-line Mistrals my jump rotations roll out straight! To me the Mistrals want to go straight but they will turn responsively as soon as you press the edge. As for boots, my wife was in dire need of some new boots for figures. We waited until Nationals so we could try some different ones on so she didn't have to order boots blindly. She has a wider foot so we knew that would be an issue and she would need a custom fit. We ended up getting her Edea Suanos which she loves. The Reidell boots (not sure of the model) that she was in had too much flex and slightly too big. While we were there I decided to try on the Edea Flys. I did not intend on buying boots just yet but these boots fit like a glove but yet still gave me a little more wiggle room around the toe. My feet weren't cramped in them like my Risports. After nationals I unmounted the Mistrals from my Risport boots and put the Fly's on. Once again it didn't take me long at all to get used to them. Within minutes I was a able to jump and spin with no issues at all. The boots are a bit lighter than my Ripsport boots. They feel like the mix between a stiff Rollerblade boot (if you've ever been in one) and a tennis shoe! You get the best of both worlds; stiffness and stability for jumps, comfort for wearing for long periods of time. The Edea boots are made of Nylon and fiberglass vs leather like many traditional boots. They are also heat moldable so they are easy to get an exact fit to your foot. Ergonimically the Edea's have a wider footbed, lower center of gravity, and flat sole mounting. This keeps the boot stiff, stable and allows you to feel more edge control. I could really feel the difference between my Risports and the Edeas. Just a small bit of pressure and I get an instant edge for quick 3 turns, spins and jumps. The only thing that I don't quite like about the Edea boots is the back of the boot seems a bit high. When I point my foot I can feel it cut in the lower part of my calf. I didn't have this issue in my Risports but I'm slowly getting used to it. As for wheels I'm skating on a mix of Roll-line Mustangs and Leopards. Our floor is really tight so the Mustangs are for griping and the Leopards are for sliding around on spins. I still currently have an Atlas E86 figure plate and Risport Super Cristalo on my figure skates. I don't plan on changing those out anytime soon as I'm still very comfortable in them. 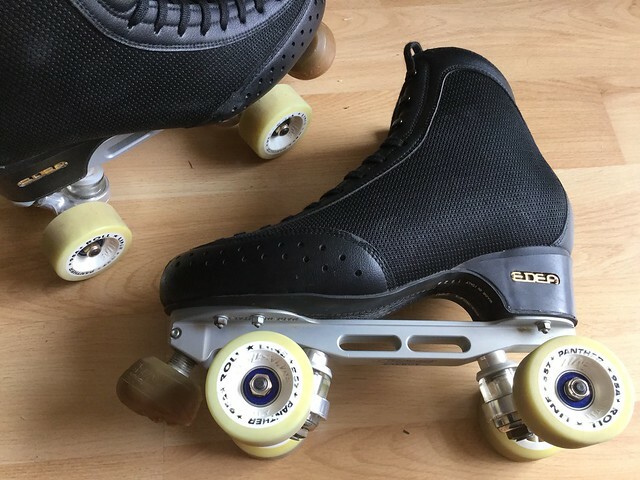 I also have an Atlas Artistic Inline plate with a Risport Super Cristalo and I think I will end up changing that to another Edea boot for freestyle but probably not until Nationals next year. I would love a boot for them now but I'm not competing in inlines so no rush on them. Hope this helps others considering different equipment. I always wished I found more reviews on stuff I was interested in and sometimes they can be hard to come by. I try to write as many reviews as I can to help others looking for the same thing. Any questions feel free to ask. Last edited by markwphoto; September 22nd, 2017 at 03:52 PM. Good write up. But please clarify your wheel selection. "As for wheels I'm skating on a mix of Roll-line Mustangs and Leopards. Our floor is really tight so the Mustangs are for griping and the Panthers are for sliding around on spins." Are you using three different wheels? I see a panther on the right front, a leopard on the back, but where are the mustangs? Sorry for the confusion, I corrected the post. I'm actually using the just two wheels; Mustangs and Leopards. The Leopards help with sliding the wheel around for spins whether I'm spinning the Inner Back on the left foot or outer back on the right foot. I also sometimes do a left outer forward which is why I also have a Leopard on the Left skate, Front Left. Very nice write up with good information. Thanks. Very nice write-up. Looks almost like my new 'second hand' skates that I bought recently.